I hope everyone has had a very spooky and fun Halloween, or just a nice Tuesday! 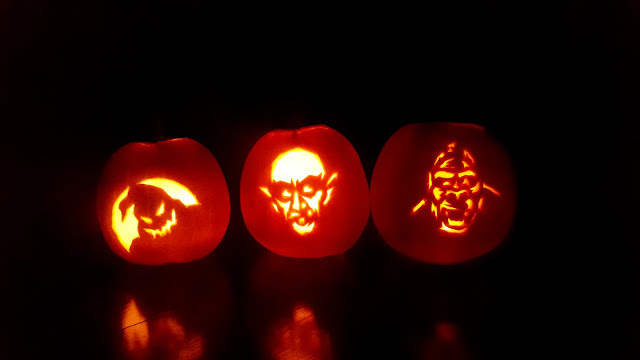 :) These are my pumpkins this year, The Oogie Boogie Man, Nosferatu and King Kong. I think they turned out pretty well!! I got inspired to do Nosferatu from Michael at Scribble Picnic, who drew a nice scary Nosferatu for his Inktober drawing challenge! Speaking of that, this week's Scribble Picnic theme is "Toy!". Because of the crazy Nor'easter wind storm we've had the last few days, I stuck to decorating inside. And I only decorated our "breakfast bar". With the 5 dogs, I barely had time to hang my skeletons lol! I made Jack O' Lantern Cocktails. Isn't the garnish cool? 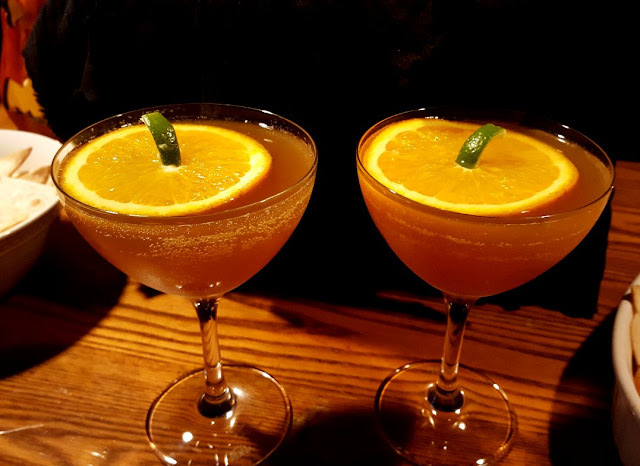 It's an orange juice drink with some brandy and Grand Marnier. Delish! Made us slightly drowsy while we watched The Mummy with Christopher Lee! 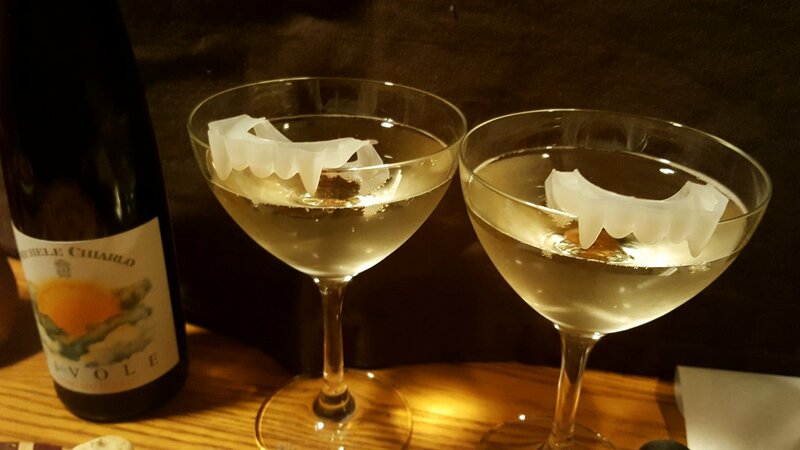 We had some sparkling wine and I added some vampire teeth for fun! Okay.....you are definitely and ARTIST!!! Those pumpkins are beautiful....how do you do that? Do you trace or draw them on there first? When my kids were little I had a hard time just doing the regular jack o' lantern face! LOL! My daughter the art teacher really gets into too. One year she carved 12! That was BK (before kids). I have a ceramic jack o' lantern now that has an electric light in it that I put in the window. My Aunt made it years ago. I miss the roasted pumpkin seeds though. Your decorations are awesome and all the special Halloween dishes and drinks look wonderful and tasty too! I really didn't get to celebrate too much as between the Trick or Treaters and the grands calling to tell me all about their 'adventures'.....there was no movie or special food other than I had made brat and cheddar soup the day before which is pretty 'special' in my book! LOL! It was a great Halloween here weather wise and about 9:00 p.m. it started raining and still today so now it's just plain cozy. What a great celebration you 2 had! I wish I could have been there to partake! Oh, I love Young Frankenstein....a classic for sure! you two sure know how to have fun! glad you had a good one! Love your jack-o-lanterns! And your very creative food and drinks! What fun at your place! Your jack-o-lanterns are amazing. And the food and drinks. OHMYGOSH... You are quite the artist, Rain. You really know how to celebrate. 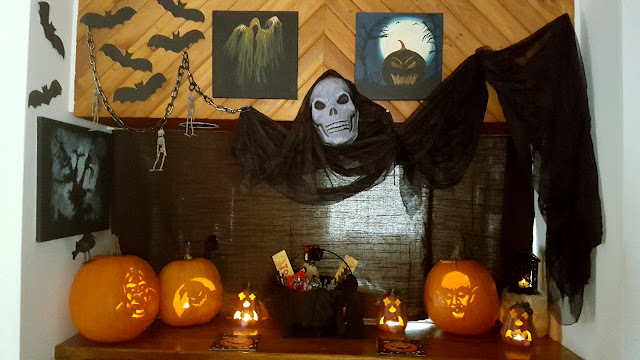 Your breakfast bar is spooktacular :) I love all your artwork, too. Good stuff! I always enjoy your blog posts. 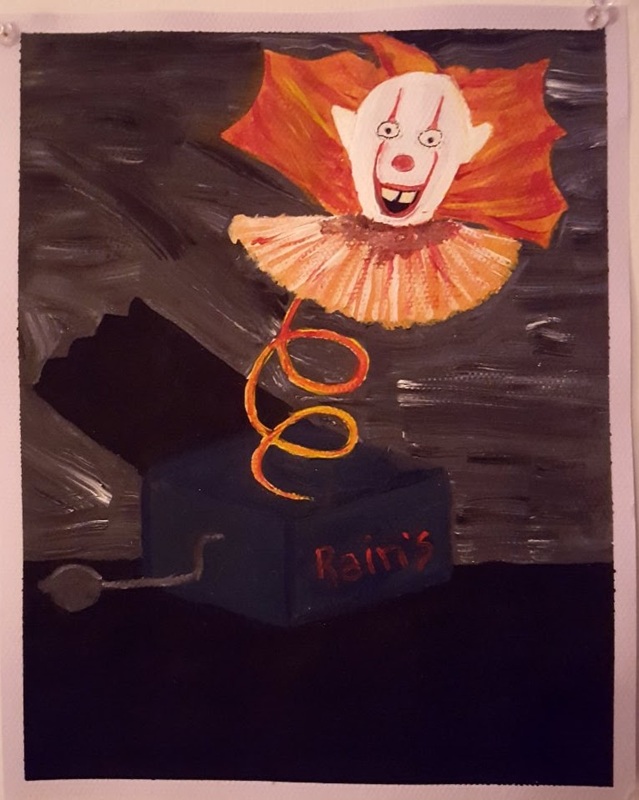 Your "toy" painting brings back memories of those jack-in-the-box pop up toys that scared so many little ones. Curious that what was created as a child's toy often brought tears and wails to children. I may well be reading something into your painting, but I don't get a happy feeling from it. (Enough of the maudlin stuff.) You are a truly talented, creative artist!! I’m all for the Halloween cocktails and dessert. We had cheese and crackers and got up every two minutes to answer the door for all the little gremlins in the neighborhood. This year Halloween went over our heads. The husband wants to be more festive next year; he said his co-worker carved 17 pumpkins last weekend for the holiday. 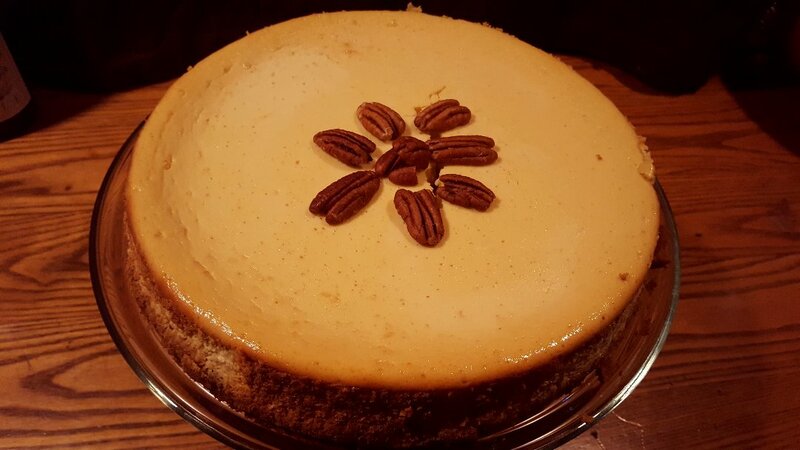 Your cheesecake looks wonderful! Sorry it wasn't pumpkiny enough for you. I LOVE your carved pumpkins...definitely works of art...even down to the food. And, of course, you have to watch scary movies on Halloween, don't you? We planned to but the Trick-or-Treaters were quite a distraction (love them) so we watched some Charmed episodes instead. I have the series on DVD. LOVE Nosferatu! The very old movie with him in it is my favorite! 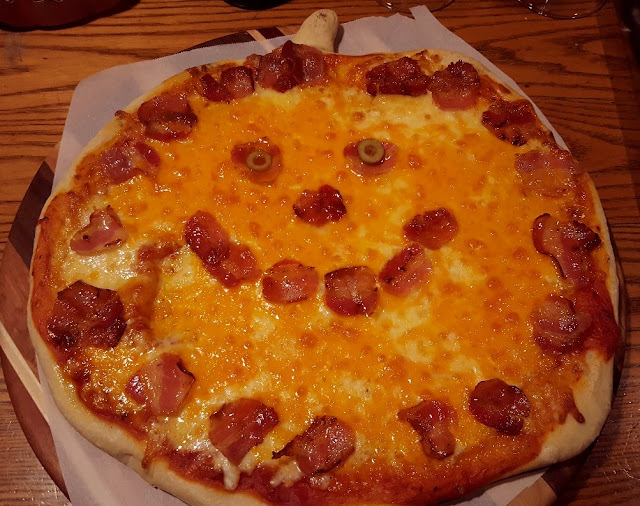 You did well - from the decs to the food! You could have a great decorating talent! Great job with Nosferatu! Your pumpkins are fantastic as is your Halloween food, fun fun fun! Awesome pumpkins!! The toys I always thought were creepy are the cymbal monkeys. I am pretty sure it was thanks to a short story by Stephen King as well as them just looking creepy in general. I admire you....you do all those thing for you and your fellow! And the dogs and cats too! haha....I love the extra steps you take with the meals! I love it all. Wow! You really get into the holiday - how fun. I love your decorations and your Jack-in-the Box is appropriately scary. Happy Halloween! You two really know how to have fun! I will have to get back to pumpkin carving next year - yours are fabulous! WOW you know how to celebrate! Every thing looks fabulous and yummy. yum yum. Thanks Joyce :) I hope you had a fun evening too! 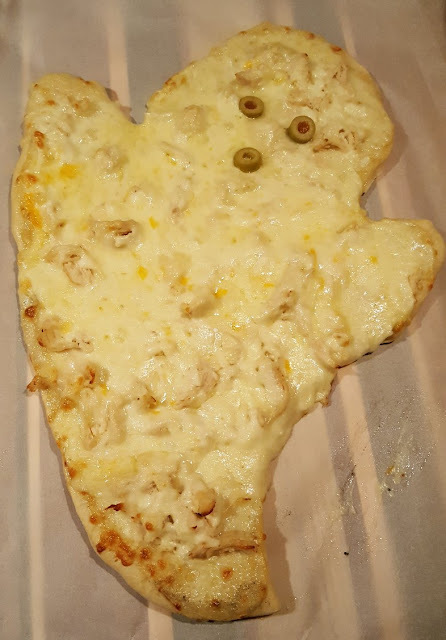 Thanks Starting Over :) I was thinking of a kind of cheese and appetizer dinner, then I saw those pizza images and wanted to make those! We had no kids come by, this is more of a retirement village. Any kids are usually bused over to the church for a party. Thanks Stefanie :) I'm not sure why the pumpkin flavour didn't come through, but I won't give up. :) It's still good, actually I had to put half in the freezer, it's very filling! Your hubby's co-worker is DETERMINED...seventeen pumpkins is quite insane to me lol...all in one shot? That must have taken so long! If I had the right tools, I'd probably get them done quicker! I tried using a Dremel but everything was orange after, it was a messy job! Lol Serena, the cocktails were really good! :) I felt like making more, but I'm a lightweight when it comes to spirits. I'm glad you had a witchy night :) I never saw that show, just a few episodes, I'm a big fan of Supernatural, love that show, it's quite spooky! :) I should download the series. Thanks Dianna :) It was fun to carve those patterns. I found them on Zombie Pumpkins and a whole new world of interesting designs is now open to me!! I need better knifes though. Something really thin would be good for detail work, I was using toothpicks at one point and they kept breaking! Thanks Jenn :) Oh yes, the "Monkey Shines" monkey...now that creeped me out and I nearly painted it!! Thank you Pam :) I guess I just want to enjoy every moment and every chance I get, I celebrate and do "themed" foods! Alex and I are such homebodies, we rarely go out, so doing all this stuff at home makes dinners really fun! Thanks Lorraine :) I had a similar toy when I was younger, not as creepy as that clown though, but it scared me when I was a kid! Thank you Andrea :) What a nice comment!! I hope you enjoy our Christmas too! :) If we had kids coming on Halloween, we'd have to lock up the dogs too...they get overexcited when they hear any kind of knock on the door, or voices outside! It would have been constant barking! Thanks Susan :) I hope you get back into pumpkin carving! I've done it for so many years and I really love it, I guess it's like a hobby. Thanks RO :) Come on down! :) I think the three pumpkins took a good 2 hours...I managed to watch The Great Pumpkin and 6-7 Simpsons Halloween episodes while I carved! Any movie with Christopher Lee is bound to be a good one! The Mummy was great, of course Peter Cushing was in it too, and we're big fans of his work. It was a great scary evening! :) Fun too! Wow! You do it up right, Rain. Those pumpkins are spectacular, I always just cut faces on ours with a butcher knife, nothing so sleek as that! I can see why Halloween is special when you cook up such good treats and go to so much trouble. That pizza sure looked good! I always get hungry when you post all those good pictures of food. Rain, I love your pumpkins and your jack in the box was actually a toy I was considering doing too. They can be so scary. Actually, as I am quite jumpy, they are always scary even when cute to me. This one in particular that you have depicted would definitely remain hidden away somewhere. Lol. Well done! Like Andrea wrote above, this is our first holiday with you online and so love how much you are in to it. So hope you are for the Christmas season too!?! 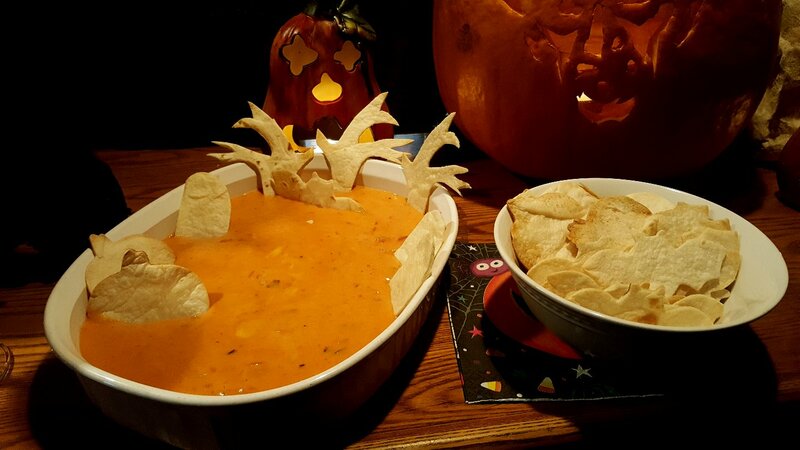 Your nacho cheese graveyard certainly gives new meaning to a "sunken" graveyard, doesn't it? I really though had to chuckle at this: "With the 5 dogs, I barely had time to hang my skeletons lol!" -I was thinking at first, "why would you hang a skeleton? Aren't they already dead?!" lol. I can be dense sometimes I suppose. Hahhahaha. Clever how you kept the decoration to indoor and bet you are glad now that we move into Thxigving not to have to worry about venturing outside to take down all that decor. Your Nosferatu pumpkin was way better than my illo, I'll have you know but love that it inspired you for the pumpkin template. :) I suspect it was the only one there. Thanks Michael :) Not only do I have a fear of those ventriloquist dummies...clowns can give me the heebie-jeebies too! Especially when they pop out of nowhere, like that Jack In The Box!!! LOL that's funny about the skeletons! Oh yes, I'm very much into Christmas...the whole Yuletide season in fact! I try to make every holiday special, Alex and I are homebodies and we don't really enjoy being out and social so making those days a big celebration makes things a lot of fun around here. :) I'm glad you liked my Nosferatu! I don't decorate much for Halloween, preferring to just keep with Fall decorations that transition to Thanksgiving. But I do appreciate your talent shown with carving those jack-o-lanterns. Nicely done! Guess I"m in the minority with jack-in-the-boxes. I remember playing with one for great lengths of time, seeing if I could tell at just the right spot in the tune when the brightly colored, happy clown would pop up!